This group of particles is from an oil sample collected from a 8400kVA transformer. This transformer was reportedly gas blanketed and sealed. The redish flake on the left is the result of the oxidation of the oil and the subsequent formation of polymer films on surfaces in the transformer. These films shrink and crack as their carbon coordination number increases. This happens when the surface they are in contact with becomes hot enough to suport these reactions. The expansion and contraction of the substrate often results in the release of fragments of this film, as seen here. There is also a degraded paper fiber in this field of view. This paper fragment has a degree of polymerization below 200. 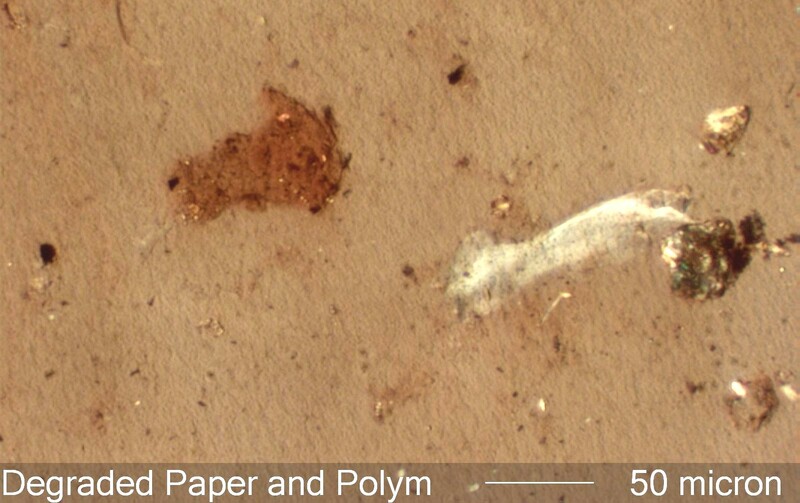 Large numbers of these degraded paper fibers indicates degradation of the core insulation.